Gene Williams and his Cotton Town Jubilee label were the subject of a post before. Today's selection is a short, spoken comment on the Vietnam war. Here's a little background information on Gene Williams, taken from my previous post. Williams was born 1938 in Tyronza, Arkansas, and attended high school in Dyess, Arkansas. He started his career in the radio business in 1958 when he took a job as a DJ on KWAM in Memphis, Tennessee. Eventually he became also the station's sales manager and began promoting Grand Ole Opry acts such as Flatt & Scruggs. In 1962, he created a new Country music stage show he called "Cotton Town Jubilee," which debuted on January 27, 1962. It was a live show held at the Rosewood Theater in Memphis and broadcasted over KWAM every Saturday night, featuring local singers and musicians as well as guest stars from the Opry. James O'Gwynn was the first guest star to appear on the show. Williams soon extended his activities by founding his own record company in the spring of 1962, the Cotton Town Jubilee label based in West Memphis, Arkansas. In addition, he also set up a music publishing company. 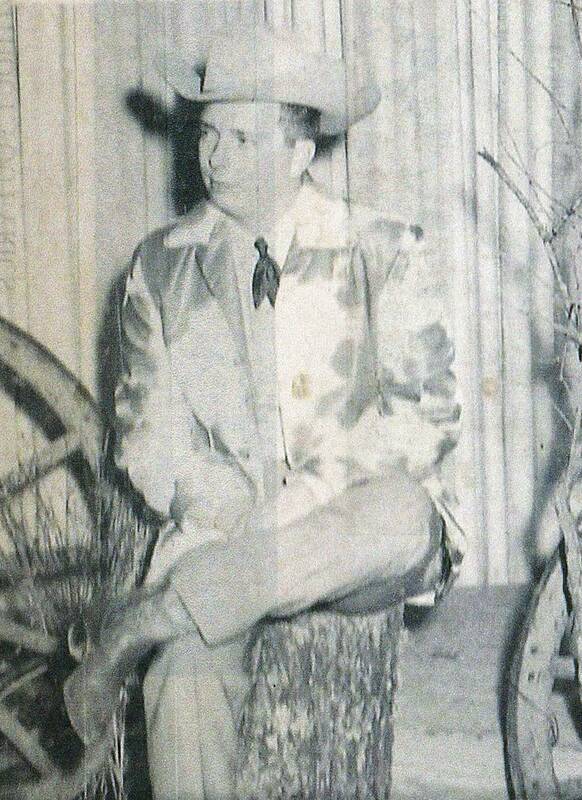 The first record release was by Sonny Williams, a singer who was a regular cast member of the Cotton Town Jubilee show. Other Cotton Town Jubilee releases include discs by Cousin Jake & Uncle Josh, Sylvia Mobley, Chuck Comer, and others. On November 4, 1963, Williams debuted on KAIT-TV in Jonesboro, Arkansas with his new show, the "Gene Williams Country Junction Show," which eventually would run until his death in 2011. 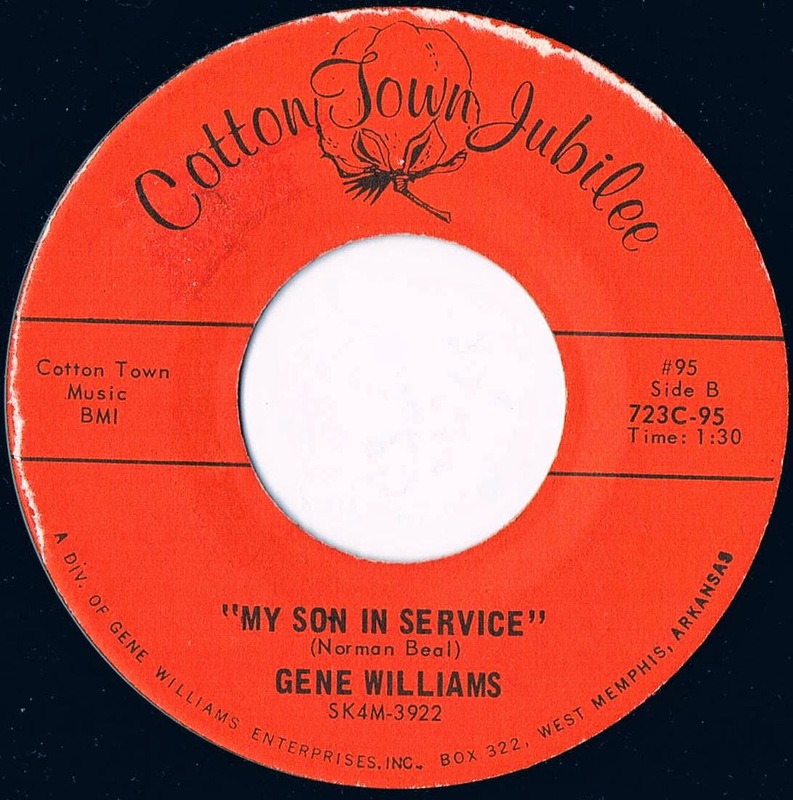 Gene Williams' "My Son in Service" was the flip side to "Christmas Poem" by Kenny Owens. Released in 1965, both tunes were written by Norman Beal, who composed another Vietnam war related song in 1966 entitled "The War in Vietnam." The numbering of this disc is somehow a mystery. The label shows the number #95 as well as 723C-95. There was another record on the Cotton Town Jubilee label that fits into that numerical system. A disc by Charles Norris and the Magnolia Playboys has no number on the label but etched in the dead wax, showing #99. All other Cotton Town Jubilee records are numbered in a 100 onwards series. Hi, my Granfather was the Norman Beal you are referring to. He wrote the song, My Son in Service. When my Dad received his orders to go to Vietnam. I have the 45 with the lyrics of they song typed and my Grandfathers signature. I don’t know much at all about him, but it was great to find a tidbit of info on him. Thank you.